Tuesday August 19th 1890 I done part of the ironing this morning and then fixed my green dress. Mother went to town in the afternoon and I worked on my linen dress and visited with Miss Lewis. Ott & Fanny and Elmer and Willie Anderson came to stay all night. Will had decided to not go to Burlington tomorrow. Wednesday August 20th 1890 We had breakfast at five oclock and went to the depot to go on the Burlington excursion. It was eight oclock before we got away and then on the 4th and last train, Miss Lewis and I got a seat. I found Ida down town and went out home with her to dinner. We then came down and went up to the park and down to the Harris house a little while. I came down to the store to get some things for Will and it began to rain so I went home with Ida to stay all night. I was very tired and we all went to bed early. Thursday August 21st 1890 It was a bright morning after the rain. We had a serious talk at the house before coming to the train. Lee did not come home with me. I talked pretty rough to Charles on the way down. Will met we at the depot when I got home and we walked over. Soon after dinner Mother went to the valley with Hatt. I did up the work and sewed some on my linen dress. I feel very tired. Ott & Fanny spent the evening here. Friday August 22nd 1890 I went to town this morning and as soon as I got back Mother went down to Halsons to spend the day. I got through with the dinner and took my work over to Marys awhile in the afternoon. Will is busy with the hay. I sewed some after supper. 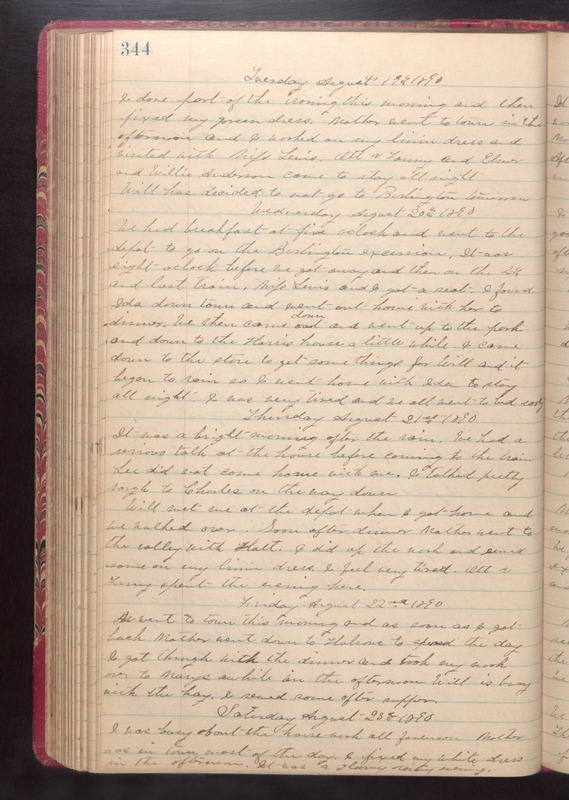 Saturday August 23rd 1890 I was busy about the house work all forenoon. Mother was in town most if the day. I fixed my white dress in the afternoon. It was a gloomy rainy evening.